'Railway Refreshment Rooms Are Often Short of Cups & Glasses', 1940s. 'Sunny South Sam', SR poster, 1939. Tom G Clayton and S W Johnson with relatives, 1899. Diesel electrics at Crewe Works, Cheshire, c 1961. The opening of the Canterbury & Whitstable Railway, Kent, 3 May 1830. Queen Victoria's royal saloon, L&NWR carriage, 1869. 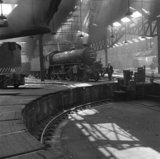 York engine shed, c 1954.